In one of Copenhagen’s underused urban spaces, Impact Farm demonstrates what a more resilient food system could look like in the future. 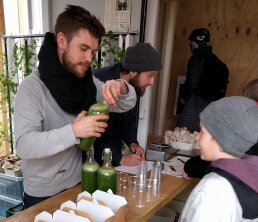 In Nørrebro, the design company Human Habitat and project owner, Miljøpunkt Nørrebro, have collaborated to find a solution to the future food challenge. The result is Impact Farm, a two-storey greenhouse spanning about 50 m2. As well as a social venue in the middle of a metropolitan area, Impact Farm is a highly efficient agricultural system, producing between three and six tonnes of crops a year. This is made possible by its hydroponic system: the crops are cultivated without soil, enabling cultivation to expand upwards across multiple levels. Impact Farm is self-sufficient, powered by wind and solar energy. Moreover, the water – sourced from rainwater collection – is recirculated within a closed loop system, thus using up to 90% less water than an average field farm. But it is not only water which embodies circularity in Impact Farm; the principles of the circular economy are central to the entire project. All materials are recyclable and, as far as possible, sustainably produced. In addition, the small urban farm is designed to be easily disassembled. It is built in a shipping container and can be easily packed up and moved to a new location, making it possible to raise awareness about innovative possibilities for producing food locally in an increasingly urban world. In 2018, Impact Farm will be located at University College Copenhagen, where the urban greenhouse will be integrated into course content. Impact Farm enables efficient food production with few resources and demonstrates that there are alternative ways of locally producing nutritious food in big cities. The project shows how urban areas can make constructive use of neglected space by both producing sustainable food and cultivating new communities. Impact Farm is inspired by the cradle-to-cradle philosophy. It is designed to impart a minimal ecological footprint and ensure a long lifespan thanks to the possibilities of recycling.